Wacky Chatter is and entertainment app. for kids by Sands of Time Ventures where you can hear silly phrases said by a mix of characters. By shaking your device or tapping the “wacky” button at the bottom center of the screen, you can make the two separate parts of the app. spin. The first has a combination of three words, and the second has a combination of three characters. So every time you spin, you get a new phrase said by different voices. The first word on the word scroll is a pronoun, the second is a verb, and the third is a noun. Some of the phrases end up being pretty simple and harmless- like “I saw balloons.” However, I feel like some of the phrases might not be the type of thing parents want their kids hearing or repeating, especially at younger ages. “You blew farts,” “She punched slugs,” or “It chewed cockroaches” just seem a little borderline to me, but at the same time I’m sure kids these days hear worse things. I just feel like this app. could have still been “wacky” without the gross element. If you want to ensure that the phrases are kid appropriate, you have the option of arranging the words yourself and choosing the characters that say them (just tap on the words/characters and press “chatter” in the bottom right of the screen). If you tap the red “who says?” button at the bottom left of the screen, you can look at the bios of all the characters. There is actually quite a bit of info in each bio- everything from nicknames to favorite foods, and even a “secret” about each one. For example, the secret about Tuft’s character is: “I almost launched our puppy into outer space.” Cute, right? There are 20 characters total for you to get to know. You also have the option of emailing the last wacky chatter phrase uttered to someone by pressing the yellow envelope located under the “who says?” button. There is also a small “i” icon in the very bottom left of the screen that gives you some brief info about the app. and how to use it. If you are a parent who doesn’t mind your kids picking up some (possibly) icky phrases, then I think Wacky Chatter is $0.99 well spent. Small hands could play with it all by themselves by shaking the device, or you could listen & laugh as a family. 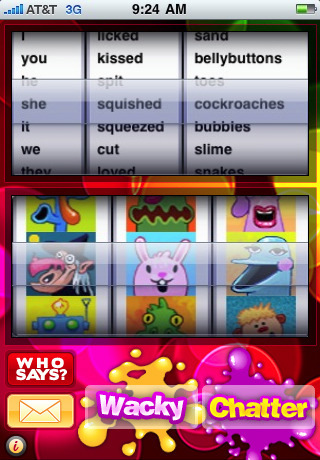 AppSafari review of Wacky Chatter was written by Tyne Kennedy on May 12th, 2010 and categorized under App Store, Fun, Games. Page viewed 3656 times, 1 so far today. Need help on using these apps? Please read the Help Page.